I spent a fantastic afternoon with my dear friend Hammie of CatTuna. Hammie is from Taiwan and spends her time between Cape Town and Taiwan. She is a amazing cook who makes some seriously yummy delsih food and each time I’m with her she makes some wonderful combo’s. Once such was an amazing peri peri prawns and mango combination, I can’t even begin to describe it, I’ll have to try my own version sometime soon. Other delights include an almond spread and a variety of dumplings and wontons. I have been asking Hammie to show me how to make her dumplings for ages and we finally made it happen. This was such a fun afternoon and I learnt so much. 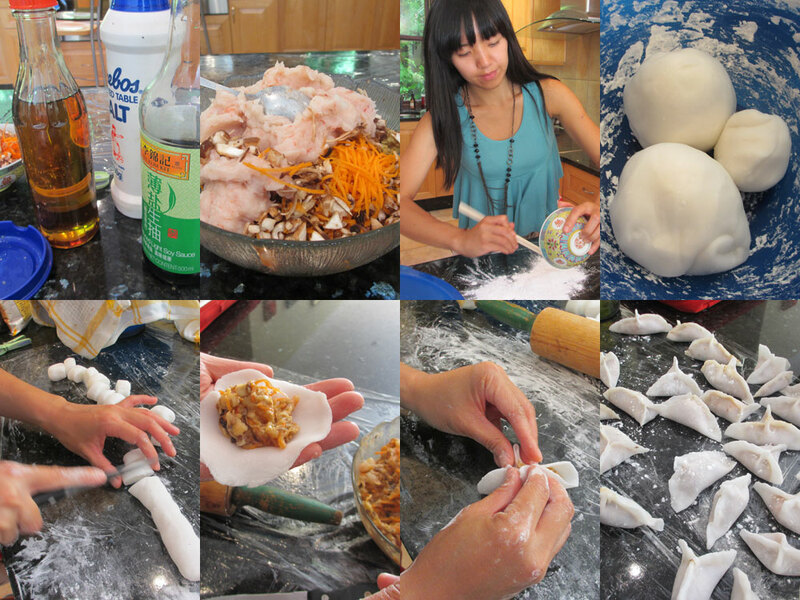 We were going to make Crystal Prawn Dumplings – from scratch! And with a whole bunch on ingredients that I hadn’t ever used. We first got the mixture for the inside ready, which included things like prawn meat, carrots, mushrooms and some other ingredients for the marinade – think white sesame oil, fresh ginger and so on. While this was marinating we needed to make the dough. Which was quite an intricate process and I’m sure I wouldn’t have been able to do this by myself if I was just reading a recipe. So thank you Hammie for your patience and superb teaching. The dough consists of wheat and tapioca starch (neither of which I’m familiar with). You need to work quickly and have a wet cloth to cover the dough with otherwise it dries out. You also work the dough quite a lot until you get the right consistency – Hammie’s was much better than mine and you could actually tell. Hers became smooth and even in no time, mine was still a bit lumpy. You then need to roll out the dough into sections and fill it before you make it into the sort of triangle shapes. Mine were superbly, um – lets say eclectic! I wasn’t able to keep the shapes very consistent, but that’s not to much of an issue because it’s more about the taste with these things. Once we had them all done – and believe me this makes a fair number of dumplings so we were able to have our fill and I even got some to take home, which Hammie told me you can freeze and defrost before you want to steam them. 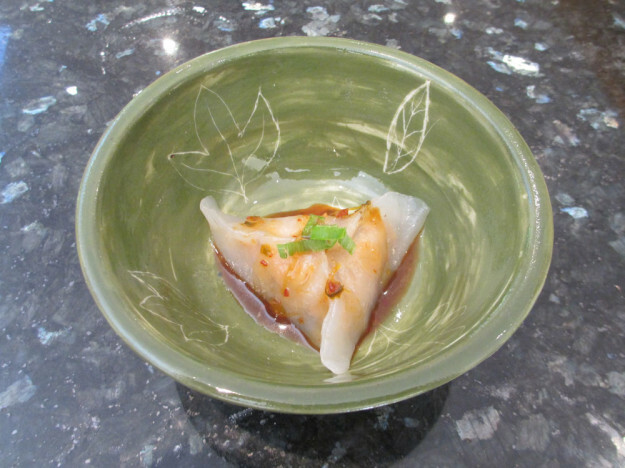 You steam the dumplings and then serve them with a drizzle of soya sauce and some chopped spring onions. The cool thing is that you can stuff these with whatever you like really. I’m keen to give them another bash – who is inviting themselves round for dinner? This entry was posted in Eat and tagged cooking with friends, dumplings, learning, new, yummy delish. Wow Tania, these really look amazing! They are ridiculously tasty, all the hard work was definitely worth it (actually not hard work – just time consuming). Very cool, Hammie & Tania!